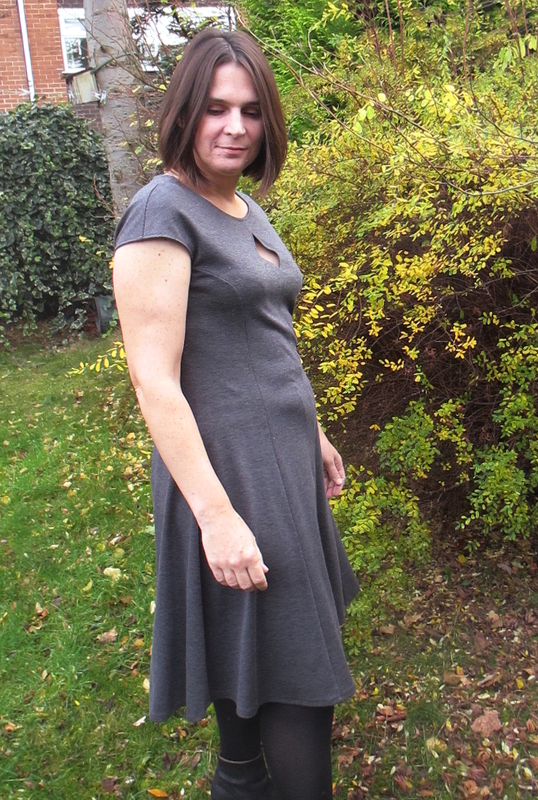 Anyway – the clouds parted briefly on Sunday so I rushed out to get pictures of my new dress – braving the cold! The good thing about waiting before posting about this dress is that I have had a chance to wear it a few times so I can confirm that I do really like it and it is in regular wardrobe rotation. 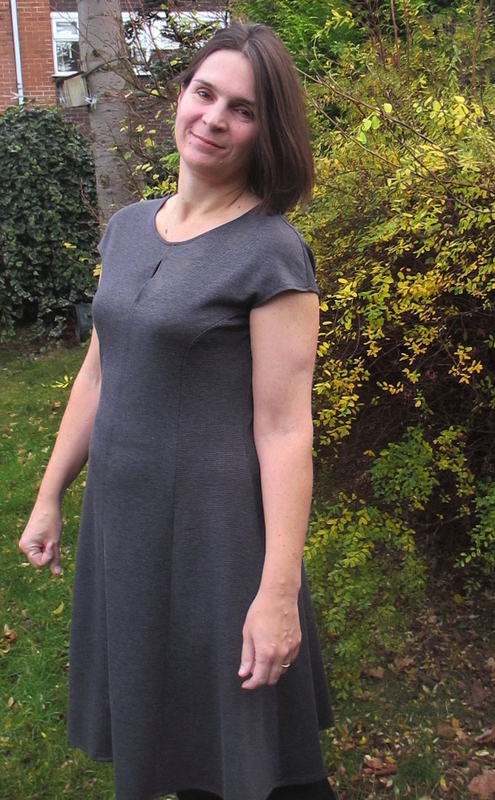 I needed a new work appropriate dress as part of my FESA plans – I originally intended to make a wrap dress, but in the end I decided to use a pattern I already knew so I could make something quick! 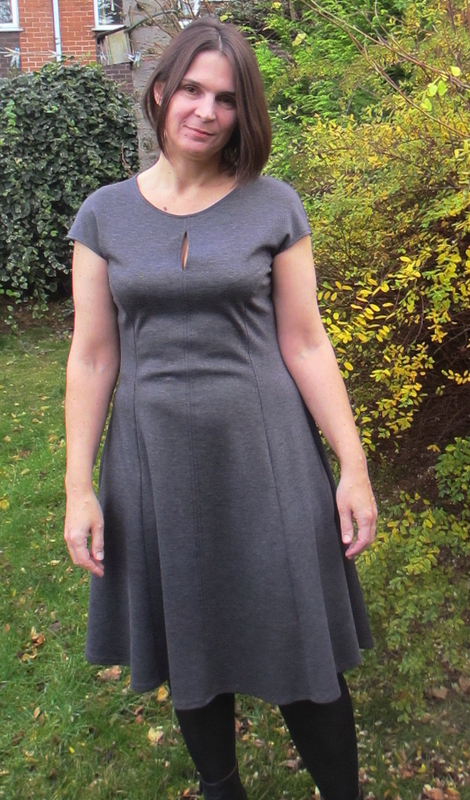 I picked up this fine striped dark grey ponte at Barry’s during the Sewbrum meetup and I knew it would be perfect. 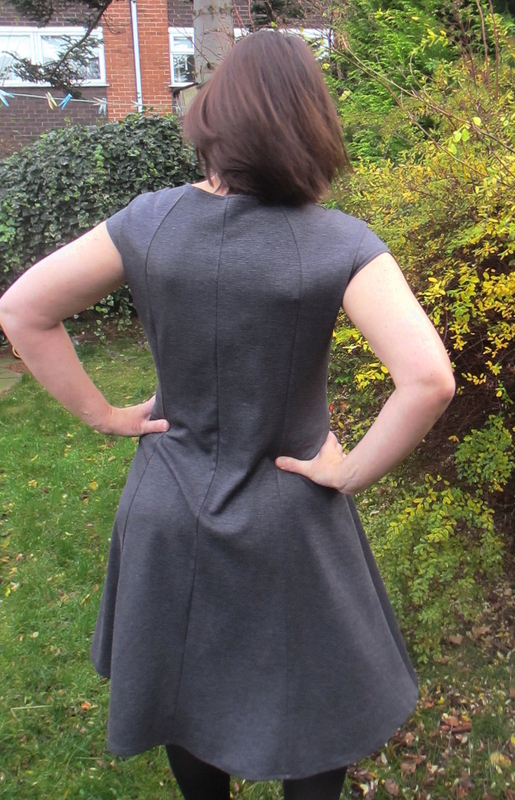 I made a first version of the Sewaholic Davie dress earlier in the year, very soon after the pattern was released. I used a really stretchy viscose jersey fabric last time and I blamed the stretchy fabric when I had to raise the shoulders about three inches because the under-arm and princess seam were sitting very low – resulting in quite a lot of side bra on show. Looking at other versions I can see that several other people made a similar adjustment and looking at the length of the armscye I decided I would need to raise the underarm seam by at least an inch so I adjusted the pattern before cutting out. The Davie comes together very easily. I stitched the centre front seam on my machine so I could make the centre keyhole more easily. I top-stitched the centre seam but I sewed all the other seams on my overlocker for speed and didn’t do any other top stitching. I pinned the side seams before sewing everything up and I found that despite the adjustments I made to the pattern, the armscye was still too low. I ended up taking a further inch off the side seams from underarm to waist to pull everything in and lifting the shoulder seam about an inch and a half. Next time I will fold this out of the top of the bodice pieces above the bust line and probably go down a size for bust and shoulders. The keyhole is still slightly lower than is ideal (I think I might have had to sew it up if I hadn’t raised the shoulder seam and pulled it up a bit higher!) 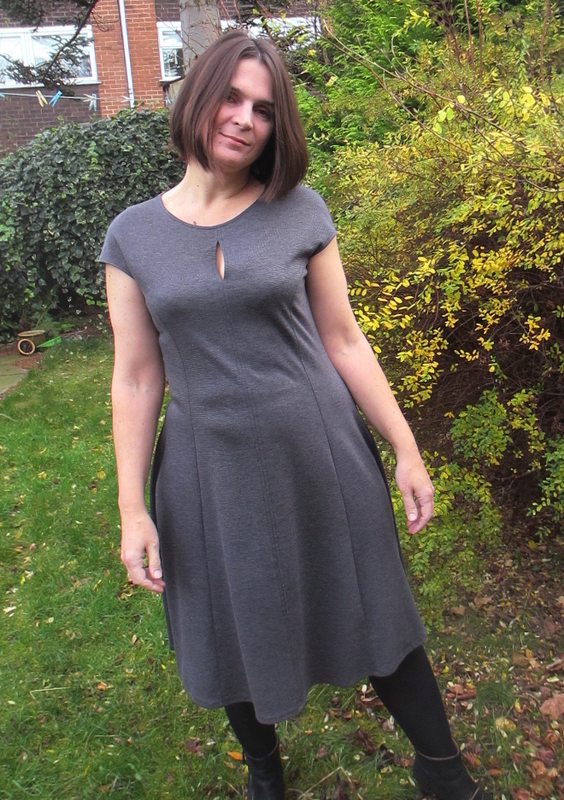 I used a strip of viscose jersey to bind the neckline and sleeves. Last time I just turned under the edges and topstitched but that was quite fiddly and the binding gave a much neater finish. This is the perfect work dress, its cosy to wear, doesn’t need any ironing, looks smart and has a twirly skirt! So who else is still struggling to finish autumn sewing plans when it is already winter? I would love to sew a Christmas party dress, if I could just finish a few other things first…. Next Post Make coat, wear coat, fly! I still have the fabric I bought to make a Christmas dress last year – maybe this year I’ll actually use it, although given the presents I still need to make perhaps not!! Tell me about it – I have three pieces of fabric from sewbrum to use and three more pieces I bought since then! Then I keep buying patterns that don’t match the fabric I have! Thankyou – it is perfect for winter – cosy and easy to wear! That’s a lovely dress! Not only practical but very classy! Thankyou! It’s absolutely perfect for work! This is looking great – perfect for work! Thankyou – I seem to be having a monochrome autumn! I so love workwear that you don’t have to iron, so this sounds perfect, especially as it’s cosy too. Looks a really useful piece to dress up and down. Now I want to try the Davie! And I’m supposed to be off dresses at the moment. Drat! This is making me want to buy the Davie pattern. Great everyday dress. Well done. Thankyou – I really like this shape – and jersey dresses are always a win! Looks great – the perfect wardrobe staple! Thankyou! I will probably have to make some more! I’ve got this dress pattern. Plan on making it soon. Glad it turned out so lovely! 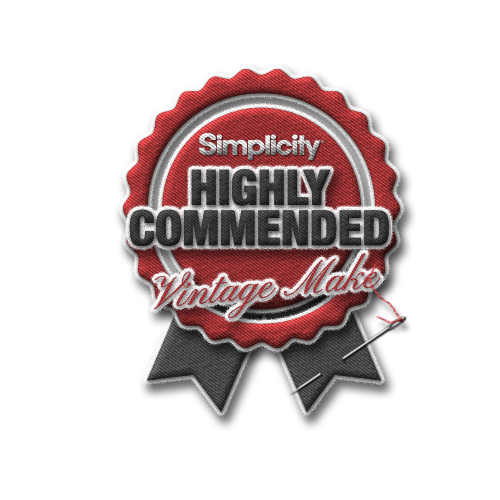 Thankyou – definitely worth a go!